The most westerly, by a tiny fraction is Moomaid’s of Zennor. Robert Monies, aged 28, and his brother Nicky make their ice cream on Tremedda Farm which has been in the family for over 100 years. At the other extreme end near Bude, Sarah Redman, 38, makes Daisy’s on Hackthorne Farm. Not only are they the county’s newest ice cream producers they are also in a very real sense both the ‘First’ and the ‘Last’ in Cornwall. When and why did you start to make ice cream? Moomaid: My brother and I were looking to realise a family dream of making ice cream and capitalise on the growing trend for local produce. Plus the fact they we had litres of milk at our disposal. Launched in December 2006, ‘Moomaid of Zennor’ was inspired by the ‘The Mermaid of Zennor’, a tale in which a young Cornishman is lured into the sea by a beautiful mermaid. Benefiting from the renowned quality of Rodda’s Clotted Cream, which the farm’s milk goes into making, we unveiled an unrivalled ‘Cornish Clotted Cream’ ice cream along with specials such as ‘Almond and Amarena Cherry’, ‘Chocolate Sorbet’, ‘Fig’, and ‘Pink Champagne Sorbet’. Starting virtually straight out of university I have had to learn everything on the job. Daisy’s: We needed to diversify into something to survive as dairy farmers. It happens that I’m also trained chef. In this area there was a gap in the market for luxury ice cream. We made our first delivery on 1st July 2010. We are Daisy’s after my daughter. Moomaid: 30 flavours of irresistible luxury Cornish ice cream and sorbet made by combining milk and cream from the farm’s Friesians with the finest fruit and ingredients I can get my hands on. Most of our ingredients and equipment are sourced from Italy but of course, the key ingredient in our ice cream comes from across the yard from the milking parlour. 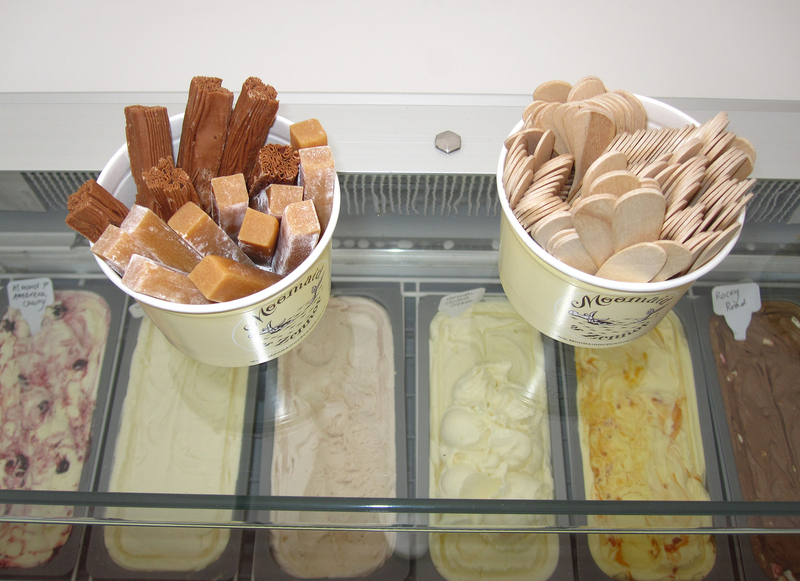 Daisy’s: We make Gelato from our mixed herd of Friesian, Jersey, Guernsey and Ayshire cows. It’s much denser as less air is whipped into the mixture giving it an amazing, rich flavour. Less fat in gelato means it doesn’t coat the mouth making the flavours really intense. Many of our flavours are seasonal, especially when there’s a local glut of rhubarb for example. How do you develop new flavours? Moomaid: My passion for food has seen me stewing fruit and experimenting with flavours in the early hours. I’m solely responsible for creating new flavours, whether it’s in reaction to food trends, the needs of our customers or even by visiting other countries. Daisy’s: I get most of my flavour ideas suggested to me or though recommendations. It’s easy to make bespoke flavours as I make in small batches; for example ‘Honey and Apricot’ for a local pub or ‘Scrumpy Cider’ for a recent wedding. What new flavours can we look out for this summer? Moomaid: ‘Limoncello’, ‘Orange and Mascarpone’ and ‘Plum Sorbet’. We made a ‘Rocky Road’ exclusively for London’s Rugby Rocks festival in June that was such a hit we plan on rolling it out in Cornwall. Daisy’s: We have lots of events booked and I will be taking at least one special flavour to each, look out for ‘Pimms’, ‘Cider Sorbet’, ‘Elderflower’, ‘White Chocolate’ and seasonal soft fruits maybe a grown-up boozy flavour or two. Where can people taste your ice cream? Moomaid: Top-end restaurants and hotels, including The Bedruthan Steps and Porthminster Café, in delis and shops, across Cornwall and tourist attractions such as the Eden Project. In 2009, we launched our flagship Moomaid Ice Cream Parlour, on the Wharf in St Ives. This year, we opened a second parlour on the beach front in Porthtowan. Daisy’s: We will be at lots of food festivals, agricultural shows, fetes and fairs this summer. We are also increasing the number of stockists from Penzance to Bristol, including the National Trust and RHS Gardens in Torrington. What makes your ice cream special? 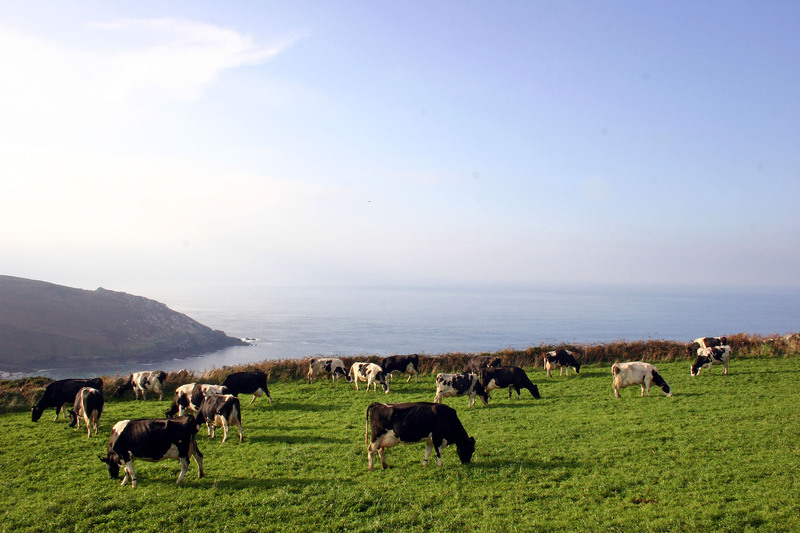 Moomaid: A combination of traditional Cornish and unusual foreign flavours and quality is at the heart of the business. Moomaid is not only more luxurious it also has a strong brand. While the quality of the product speaks for itself, the logo design, the beauty of the farm’s surroundings and story behind the name have helped seen its popularity soar over the past three years. I am constantly seeking new, different suppliers to better our product and contribute to new and wonderful flavours. Daisy’s: You will never find our products in supermarkets; we want to support interesting, passionate and independent retailers with a personal service. If people have a special event we love to make bespoke special flavours for them. We also have a traditional ‘stop-me-and-buy-one’ ice cream trike available to hire. Your favourite Cornish ice cream, after your own? Moomaid: Roskilly’s: it’s genuinely good quality ice cream, which is particularly impressive considering how big they are now. 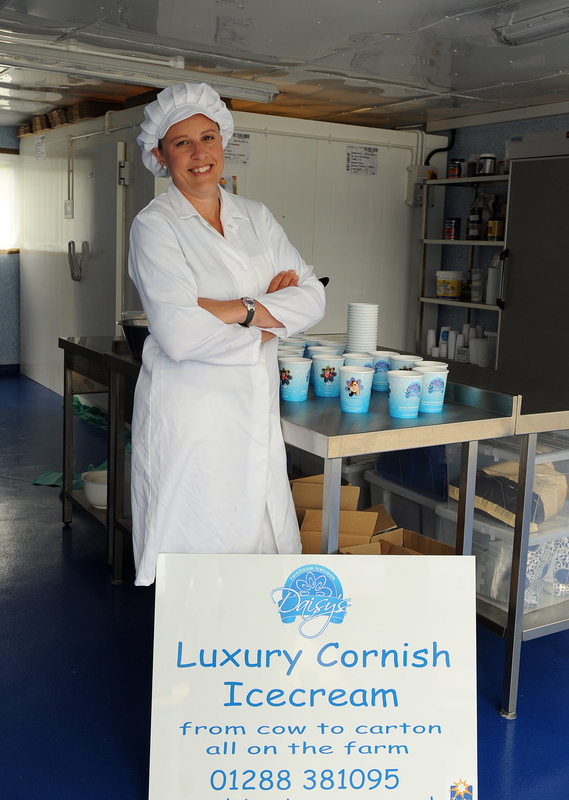 Daisy’s: I’m not sure as we are so far away from other Cornish ice cream makers. I had a Callestick ‘Strawberry’ recently and that was really delicious. This entry was posted in Cheese & Dairy, Food Reviews and tagged Bude, Cornwall Today, Dairy, Eden Project, Fresh Cornish food, Ice cream, Love Cornish Food, Marhamchurch, Moomaid, Zennor. I had a Moomaid Blackberry ice cream at the Newlyn Fish Festival. It was absolutely the best, most delicious ice cream I’d tasted in an age.